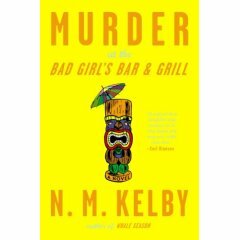 Kudos to high school friend and Civitan-sister Nicole (N. M.) Kelby for a great read: Murder at the Bad Girl's Bar and Grill. I finished it over the fourth of July weekend, laying on a hammock on a shady bluff overlooking a Minnesota lake, but for the past several days it had transported me to the gated community on Florida's Gulf Coast where scandal and murder fuel "black humor that sizzles." Ever since I read my first Nancy Drew I've loved mysteries. This one delivered a delightfully entertaining and satisfying mystery, but more. I saw Nicole at a reading here in Minneapolis and she said that after 9/11 she felt her readers needed more fun in their lives and so her writing took a shift. Yes, Murder at BGBG delivers fun, but more. She also said she wants her work to be more than a fluffy read, but for it to mean something, to do some good. After hearing Nicole say that and while reading the book I was reminded of a quote I love by Louise Bogan: "In a time lacking in truth and certainty and filled with anguish and despair, no woman should be shamefaced in attempting to give back to the world, through her work, a portion of its lost heart." With the help of a wacky cast of characters some of the lost heart that Kelby helps restore with this work is a reminder of joy and beauty in the midst of tragedy and danger. Joy and sorrow travel together, and often sorrow is easier to see. Through symbol and narrative, however, Kelby highlights the sure presence of joy. In some instances, the joy is surprisingly beautiful. I say surprisingly because I just didn't expect the scenes of beauty that seemed to come out of nowhere. I didn't expect my eyes to suddenly tear up as rose petals fell from a plane or to hold my breath as a Santa Lucia procession wound towards the beach at sunrise. Laying on the hammock, turning the last page, I didn't want the story to end.